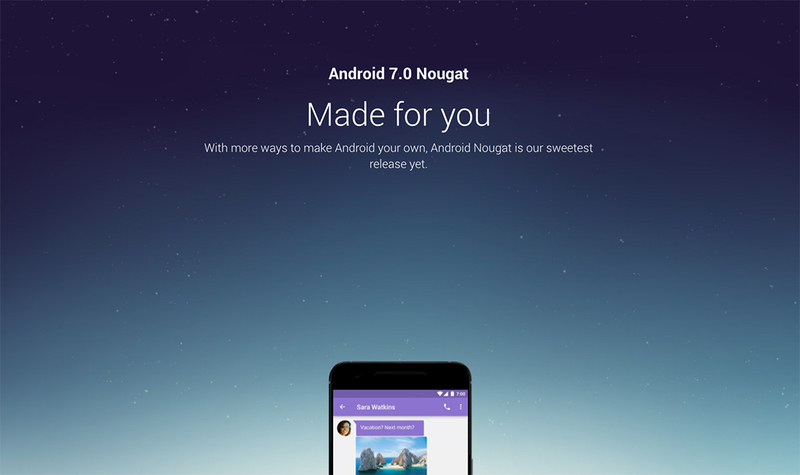 The Android 7.0 Nougat site just went live! That’s a thing that we care about, because well, we also think that Google may push out stable Nougat today to Nexus phones. Also note, at the bottom, that Google confirms that the LG V20 will be the first to run Android Nougat out of the box. In other words, the new HTC Nexus phones aren’t going to be here until after that phone arrives. For now, though, the official countdown begins for factory images and OTA .zip files. Keep it here, folks, this is going to be a fun day for Nexus owners. Update: Google says that the over-the-air (OTA) updates for Nexus devices (Nexus 6, Nexus 5X, Nexus 6P, Nexus 9, Nexus Player, and Pixel C) should start as early as today but could take several weeks to complete. If you are a part of the Android Beta program, you too will see the update to the final version. Update 2: Here is a compiled list of all the changes coming to Android 7.0. Update 4: Nexus 5X now too! TIP – if you want the update on your Nexus, just go join the Android Beta now. Updates are showing up there as I type this. Go check out the new site and list of features here! Here's Everything That's New in Android 7.0 "Nougat"